Keter’s Elite Store represents a small horizontal storage shed that aptly settles in confined areas outside a home. The silvery fascia stylishly compliments surroundings whilst the easy-to-clean weatherproof construction delivers convenience & fair value for money. 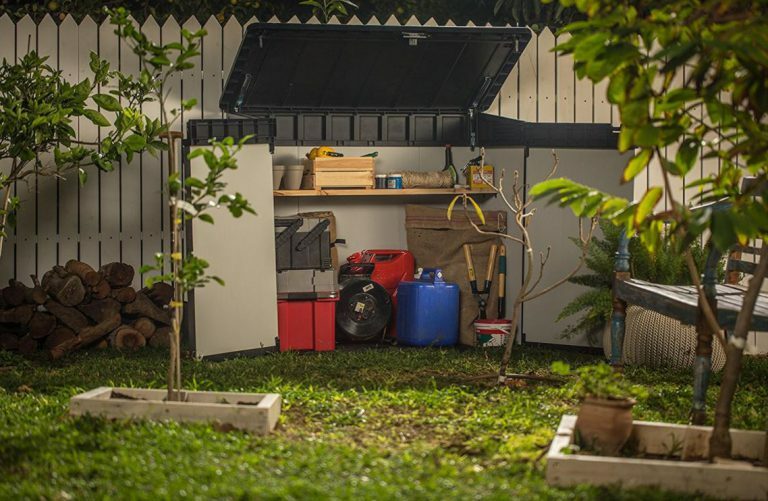 Comprising an assortment of usages, Elite’s compact store provides a shelter for gardening tools, the lawnmower & plant feed – A mini recycling station for household rubbish – Wonderful access for a kids toys haven – An outside sports equipment or work tools store – Maybe a dry-store for fire-logs lights your candle. Enhancing the patio, Elite-Store flaunts a smart silvery chic appearance into which the spacious interior caters to accommodate barbecue grilling paraphernalia, stack-able or fold-up chairs along with a conglomerate of outdoorsy accessories meanwhile the fresh & dry interior makes it ideal for towel storage and ultra-handy for squashing in a whole set of bulky outside furniture cushions. 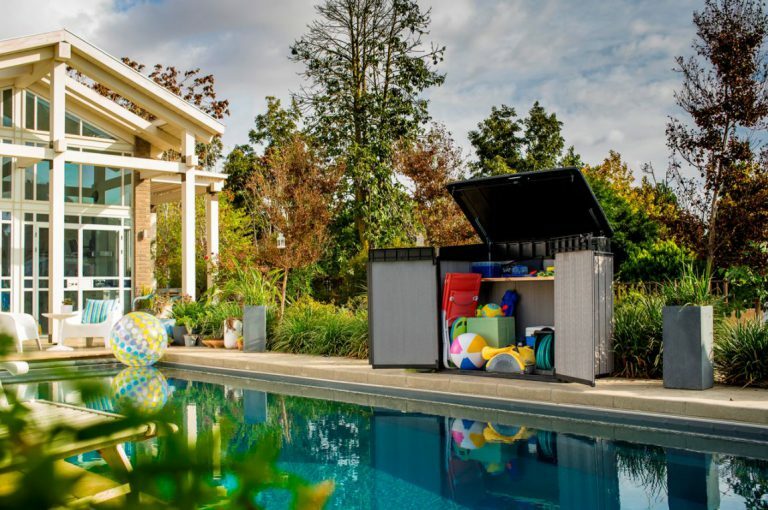 There are no specific usages, Elite caters to stylishly serve storage necessities from poolside, the urban balcony to the decked backyard and any restricted zones in between. Elite’s manufacture boasts the upper-hand to where maintenance is concerned, you won’t be confined to the annual re-varnishing cycle that’s for sure. Keter’s groundbreaking Duotech™ manufacture prides itself delivering immunity from rot therefore apart from a cleanse to spruce-up appearances, it’s upkeep-free. Constructing entails quite a rudimentary assembly procedure too. Okay, there’s a pile of screws to secure but if you’re aided by your best mate, the drill driver, you’ll have the store up & serving in minimal time. On account of the low-profile height, Elite-Store unobtrusively sits beneath the conventional garden fence-line and most window ledges, along with situating in restricted placements. Gloating a lockable triple-way entry, all 3 doors widely agape providing supreme access, the floor integrates forming part of the structure, encasing the internals from the breeze of outside debris meanwhile freshening up the silvery fascia takes minutes with a wet cloth & squirt of detergent. 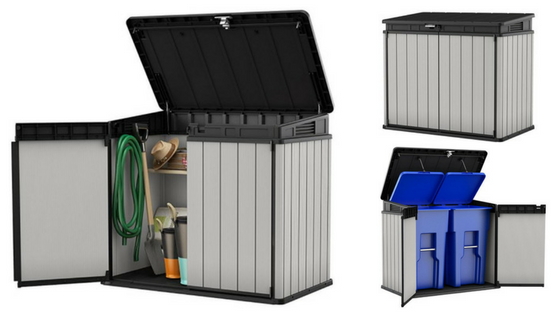 Size-wise, the Elite-Store stations between Duotech’s smaller Patio-Store and the popular larger Grande-Store that’s spacious enough to accommodate 3 wheelie trash bins whilst retaining a horizontal shape. 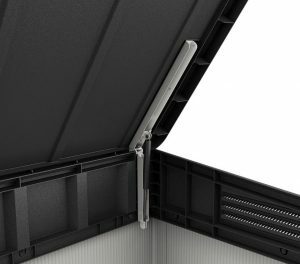 Engineered by Duotech involves moulding two separate fascia boards and connecting them together by of a corrugated internal structure. Producing a dual-skin enhances strength & rigidity along with vanquishing unsightly dents appearing to the composition. Besides creating reinforced twin lined fascia panels, the edges are formed with tongue & groove borders benefiting assembly with an easy alignment prior to securing. During manufacture, silvery pigments blend within the polypropylene base-mix producing the snazzy lustrous image that will not peel meanwhile the molding process embosses a vertical ribbed impression to the touch, creating stylish charm to the exterior. In addition to the colouring, UV inhibitors stabilise the manufacture to prevent sunburn damage bleaching the exterior along with toughening the manufacture to combat sun-scorch fracturing the skin. Duotech™ Composition is designed not to corrode nor rot, regardless of whether it’s situated in a permanent damp setting, endures countless rainfall showers or tolerates the onslaught of sunstroke. In a nutshell, it’s immune from decay therefore sidesteps re-varnishing with wood-stain for the purpose of preserving. The mere duty to spruce-up Elite’s appearance once the grime’s taken hold regards a wipe-over with a damp cloth. 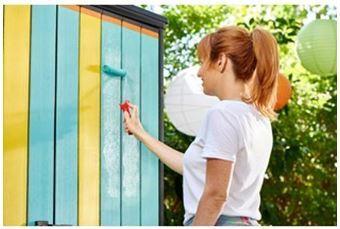 We generally hose our shed down with the shower adaptor clicked in meanwhile very occasionally we find a soft brush along with a squeeze of washing-up liquid removes moss & sap however this is merely a once-in-a-while operation, depends on one’s location & surroundings. 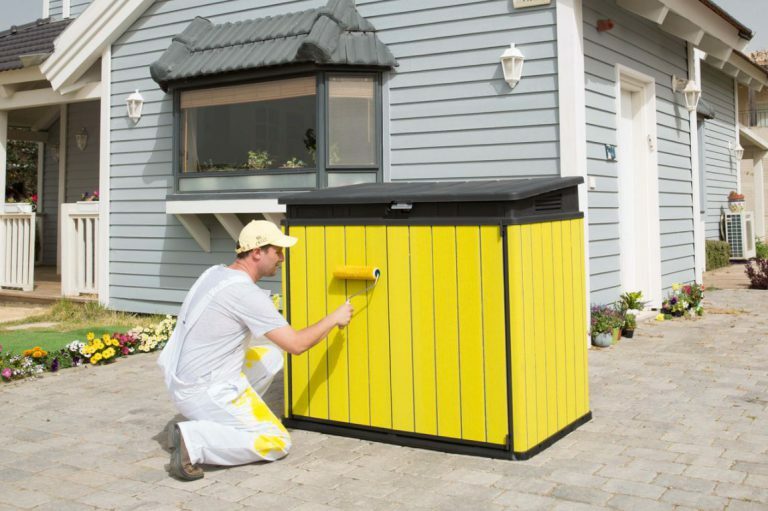 Duotech have invented the first paintable shed manufactured in resin however in contrast to the arduous task of primer followed by top coats of oil based paints such as gloss, the real benefit here is the sliver part of the manufacture has been designed to adhere to acrylic emulsion. Water-based emulsion is a joy to decorate with. It’s fast, rolls on like a dream, dries super-quick whilst the equipment washes clean in a jiffy. Acrylic paint includes a hardener to toughen the surface making it scuff-free & wipe-able. It’s usually termed Bathroom and Kitchen paint in DIY stores for decorating walls. Usually, there’s every rainbow shade to choose from meanwhile our local store mixes the paint while you wait. Besides deciding which colour shade brightens-up your home-yard you also have to choose the preference of finish, from low sheen matt shades to the shininess of gloss including egg-shell & vinyl-silk in between. It should be noted, over time & stood outdoors paint colours will inevitably fade however due to the make-up not being susceptible to weather-rot, Duotech’s preparation prior to a re-paint merely concerns a wash & dry before commencing. Time to wear you creative hat to determine your resplendent shade, then decide upon subtle matt or vivid gloss? Twin doors combine with the lid to swing ajar, after which everything’s presented within arms reach. Access couldn’t get anymore obtainable meanwhile air ventilation grids incorporate both sides to effectuate a fresh-air current to the interior, benefiting both waste disposal services for getting rid of nasty odours and seating cushion or towel storage by eliminating musty odours developing inside. Securing Elite has two options. 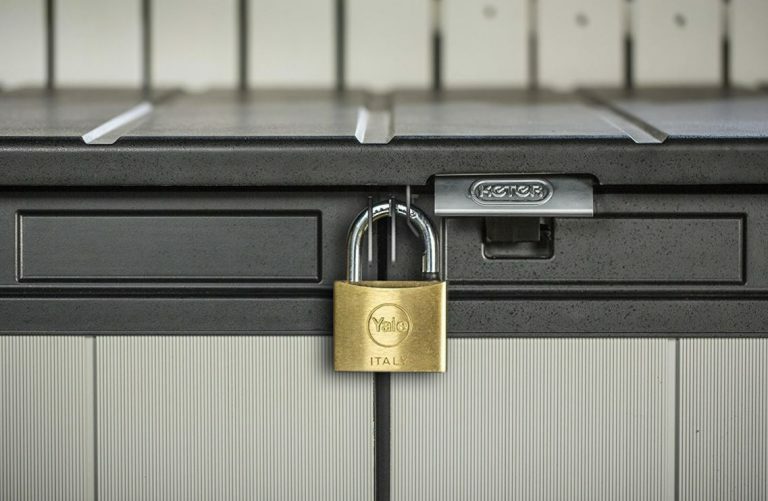 Inserting a padlock through the top holes of the clasp delivers simultaneous triple-way security, locking all 3 doors together whereas padlocking the underneath holes locks the two front doors leaving the lid to conveniently swing open for emptying refuse waste. Elite comprises a 1150 L / 41 cu. ft storage capacity. Two 63 Gal / 240 L wheelie trash cans can accommodate inside meanwhile two linking chain mechanisms are included to operate the waste bin lids simultaneous to opening Elite’s lid delivering a more hygienic method of waste disposal that doesn’t entail touching the bins. Alternatively, the Grande-Store holds 3 of these bin sizes or a couple of the extra large variety if more spacious internals are preferred meanwhile Elite’s dimensions are presented below to measure against your storage ideas. The lid comprises one sheet of black polypropylene constituting a reinforced thickened skin that slopes back-to-front down a shallow gradient in order to effectuate a prompt rainfall run-off. Aiding lifting Elite’s hefty lid expanse is virtue of two gas shock pistons that help operate a one-hand opening, swinging the lid ajar through forced pressure meanwhile the tension held within the pistons also performs a soft-close mechanism when the lid comes down preventing the lid’s full weight and the trash bin lids from slamming shut and hurting fingers. Inside Elite’s facility, the base integrates by means of interlocking the walls within the floor’s boundary which in return stops pests from scurrying their way through and helps maintain clean & dry internals by prohibiting rainwater puddles and leafy waves congregating on the inside. The floor is strengthened during manufacture to subsist the weightiness of fully loaded rubbish bins meanwhile a sloping threshold delivers ease in rolling the mower in & out. You have the option of grounding the floor through the anchor placements presented within each corner to improve stability however on account of the low height being sheltered, most people bypass this procedure. Illustrations display shelf cutting dimensions for fitting a straight-cut shelf in the instructions. 1.5″ thick plywood provides adequate shelving meanwhile adjustable brackets are included to aid the fitment. Local DIY stores where we live cut straight pieces of wood like this shelf’s dimensions on site. I’d take the measurements in and ask for cutting if I didn’t have a saw. Okay, Elite’s installation procedure may contain 30 steps that require securing a mountain of screws but it’s basic and doable for the inexperienced DIYer, similar to building a large set of Ikea drawers in my view. If two people construct, one supports whilst the other secures the panels further to using a drill driver set on low torque for driving in the screws, you’ll have this low profile unit built, stocked and serving to full potential in a short amount of time. It’s important to station Elite on solid level paving, asphalt, decking or tarmac etc to ascertain the floor copes with the full loads of rolling wheelie trash bins inside meanwhile the perpendicular standing ensures both the door & lid operations function precise. Another thing to note: Elite does not want to be stood in flood water, raise the foundations in doubts arise. Keter’s Elite-Store showcases smart classy looks that elegantly enhance balconies, patios, poolside and garden locations meanwhile unaffected by rot it’s a cinch to wipe clean, attributed by Duotech’s weather-resistant polypropylene based manufacture. Boasting multi-purpose uses from a recycling station, occupying garden tools, situated poolside keeping towels dry, conveniently located on a patio protectively storing bulky furniture cushions alongside a multitude of additional services from work tools to sporting gear describes Elite-Store’s versatility – What’s your ideas? 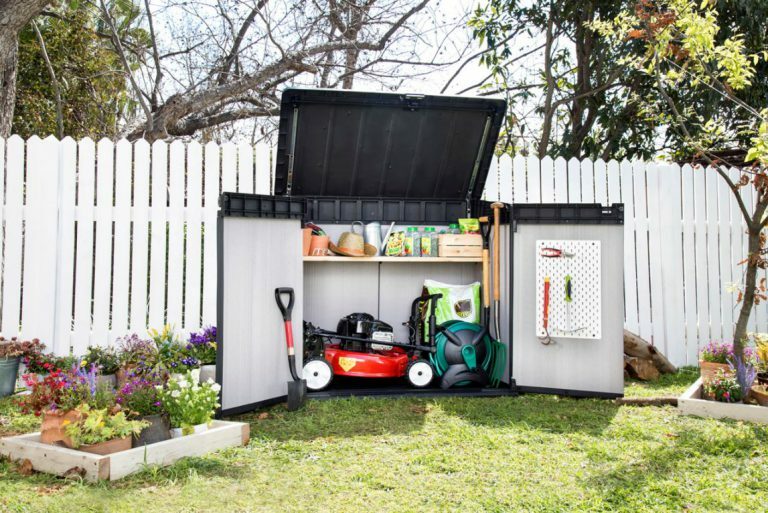 Hope Duotech’s Elite-Store provides plenty of small horizontal storage shed inspiration. 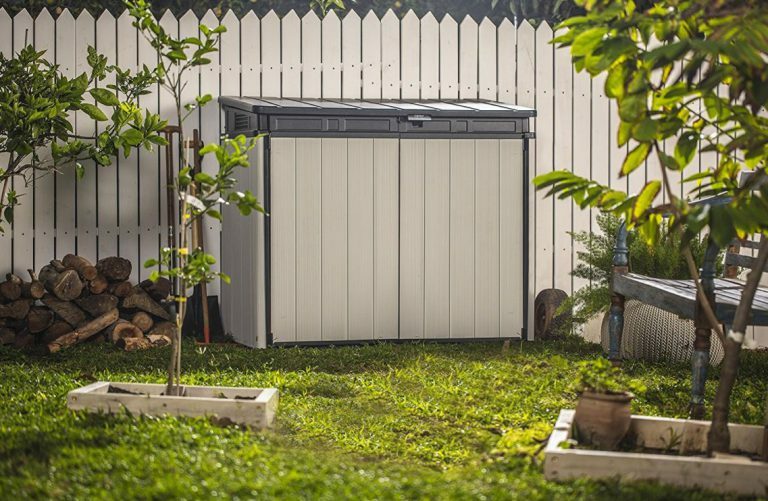 Share your preferred low-profile unit below along with any small shed queries. Please share Keter’s Elite-Store. Thank you. This shed does look good. Unfortunately, My house falls under an HOA and all structures like this have to match my house in both color and materials of construction. Do you know if they have any of these in wood? in particular cedar, spruce, or pine? Hey Steve, thanks for visiting to read about the Elite-Store. Unfortunately Duotech manufacture is resin based therefore you’ll be unable to construct this outside your home due to the strict HOA rules regarding your home’s estate. It’s surprising they won’t even allow a low profile unit to be constructed as these usually bypass the regulations due to sitting below the conventional 6 ft fence-line and most window ledges, the reason for the sudden upsurge in this horizontal design. A lady commented the other day, her estate only allowed the construction of recyclable resin sheds, you’re not allowed to erect any kind of wood nor metal sheds. These HOA rules are quite strict however she said only walk-in sheds were under the restrictions, not horizontal stores like this Elite. The only wooden store I have written a review on regards Suncast’s Hybrid deck box that constitutes a cedar wood fascia, polypropylene base & topped off with a brown resin lid to overcome puddles developing rot. 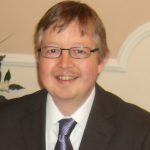 This is primarily due to this website wholly concentrating on the various weather-resistant designs of resin or polyester coated steel to be honest Steve. A quick search on Google or maybe Amazon with the keywords ‘Horizontal Cedar Wood Sheds’ and suchlike may bring up adequate results for your restrictions – Good luck. We just recently moved. My father is looking storage shed. So this article is prefect for him. I might to get one as well. This will help me get my stuff more organized. Thank you for the information. Hi Hong, thanks for inspecting Keter’s Elite-Store. If your father is looking for a storage unit whereby a 1150 litres / 41 cu. feet capacity delivers adequate accommodation room to shelter away his gardening tools and bits ‘n’ bobs, this maybe right up his street. The Elite is very straightforward to construct meanwhile much easier if you lend a hand supporting the panels whilst he secures them into place with screws, there’s a job for you – ha! You’ll have this stocked up and serving in no time plus it locates in tight spaces, sits below most window ledges and fence heights meanwhile smartly exhibits Duotech’s lustrous silvery tones therefore enhances any outside seating area with exquisite styling if a patio position is desired. Wow this is perfect! It doesn’t take up too much space and it holds just the right amount of stuff for me. You could even have a couple and organize them by what contents are inside whether garden or winter. I never realized you could put your garage cans in them. We just had a snow storm in April…YES APRIL…and my garbage cans were in my neighbors yard buried in snow. This is great! Hi Bruce, I appreciate your time exploring Keter’s Elite-Store, thank you. I am finding there’s a growing number of people opting to purchase a few of these smaller low-profile units for organising storage rather than constructing the larger walk-in variety like you mention due to their many benefits. Firstly they’re a doddle to install when you compare to the timely process spacious walk-in sheds take, they sit unobtrusively as to not obscure a garden’s outlook which is hugely beneficial when you’ve only a small house-width garden like ours plus they escape the battles of planning regulations which are becoming more strict in certain states of America. Over in the UK, planning regulations regarding the construction of a garden shed are thankfully pretty tame. 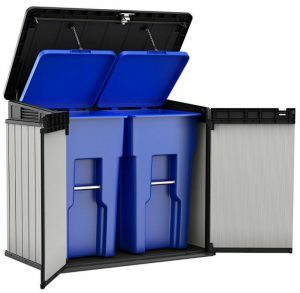 The Elite-Store fits two 63 Gallon garbage cans whilst they also include two chain mechanisms that secure to Elite’s lid as well as the wheelie bin lids. When you open Elite’s lid, the bin lids open simultaneously. I like this hygienic design because you can empty household waste without touching the bins, great idea. If hiding trash bins and creating a recycling station has spurred ideas, Keter’s Grande-Store is the next size up to the Elite and is able to accommodate three of these garbage cans or two of the larger style which maybe food for thought. Snow storms in April, whatever next. Winter’s been horrible over here in the UK too, unless I’m getting older – Roll on Summer. Hi Alenka, thanks for exploring the benefits of the Elite-Store. 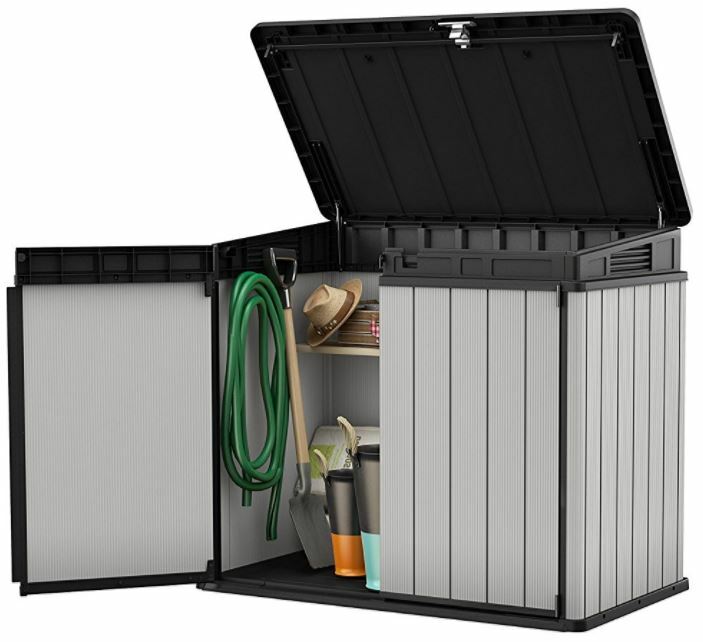 Low profile units like this deliver functionality to a home-yard and like you say, Elite’s spacious interior can accommodate a wide range of storage including concealing trash bins from sight. 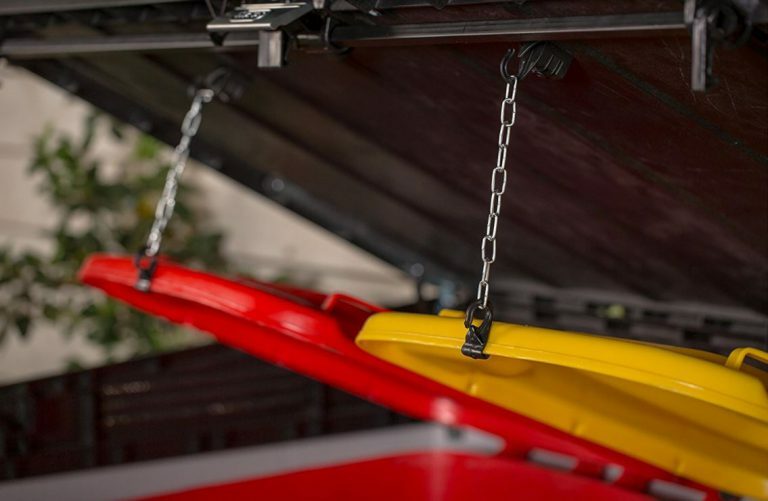 To accomplish opening the bins together regards attaching the chain mechanism to each bin lid followed by hooking the chain onto Elite’s lid, then when you open Elite, the bin lids automatically open. Not touching the bins provides a more hygienic method of waste disposal meanwhile air vents are positioned either side to create a throughput of fresh-air to the internals thereby removing waste odours. Inside there’s 1150 litres / 41 cu. 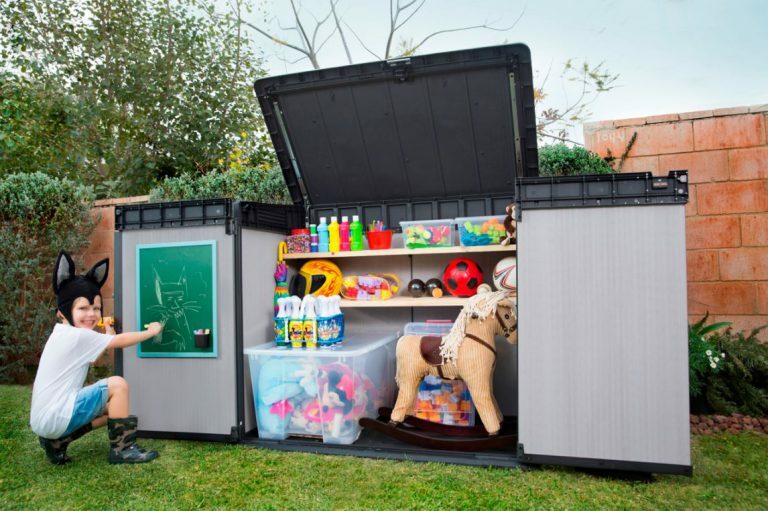 feet of storage space therefore it’ll hold a sizeable collection of toys plus when you open all 3 doors, imagine the speed of clearing the garden – great idea. Musty odours and mould growth always present problems associated with plastic containers and clammy weather however conquering the solution as with the case of refuse odours, ventilation grids generate a throughput of fresh air to continuously circulate Elite’s internals due to being positioned opposite one another. Freshness makes the inside ideal for storing towels alongside the collection of swimming gear and pool supplies. You are also able to fit a wooden shelf to better organise storage. Measurements are included within the instructions plus shelf supports are also included as part of the package. Wow, another superb shed Simon, I must say you are a shed expert. We all should buy sheds after reading your posts, recommendations and consultation. This shed is a “must buy” for me now, I love how it occupies bins in it with a lot more space. It gives our home a great look because I hate bins exposed, so, this is the best option. Thank you so much for sharing. Hi Sarah, thanks for dropping by to message about Keter’s Elite-Store. Inside the Elite you have approx to 1150 L / 41 cu. 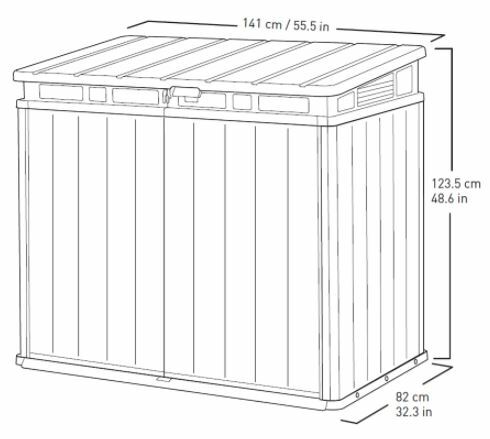 ft storage capacity so the internals will spaciously accommodate two 63 gallon / 240 litre wheelie trash bins. Hiding waste-bins out of sight and creating your own recycling station in a smart unit like this certainly improves the outlook of a home-yard meanwhile the included bin opening chains that simultaneously lift all bin lids with Elite’s lid delivers a more hygienic method of emptying rubbish. 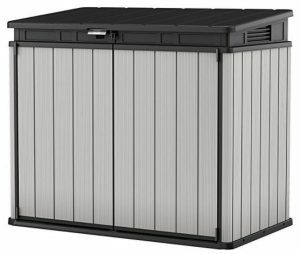 If you’re after larger dimension to accommodate two extra large wheelie bins or three trash bins this size, check out Keter’s Grande-Store. It’s manufactured from the same Duotech material and is one popular model due to being able to store more gear whilst unobtrusively station horizontally like the Elite. I also like the lustrous look presented by Duotech material. I think the neutral silvery tones compliment any outdoor space with a stylish impression meanwhile the composition presents the opportunity to decorate in your colour choice if wishes are to make a statement and brighten up the home-yard. And the beauty is, Acrylic emulsion paint is recommended, this is easy to roll on compared with oil based primer & gloss meanwhile dries super quick. Hi Simon.. thank you for a great article on the Storage sheds. I am so happy I stumbled on your site. I have an L Shaped garden and nowhere really to store the lawnmower and garden tools so this will be perfect for me. I can already imagine it in the corner of the garden. My question is “How can I get one?” I clicked on the link but it seems there is no delivery to Turkey. Do you know if there is a supplier of this product in Turkey? Hey Moni, thanks for visiting to explore Keter’s Elite-Store features. This kind of low profile unit sits below the conventional fence height which is less than half the size of a walk-in storehouse therefore has an unobtrusive appearance. You could hide this from sight in an L shaped garden although the lustrous sheen of Duotech’s make-up does enhance any outdoor surroundings portraying its classy looks. The internals are highly suited for sheltering the lawnmower and gardening tools. Firstly though, ensure the internal dimensions are spacious enough to accommodate your storage meantime ensure you have solid level ground for Elite-Store’s location to ascertain the strengthened floor copes with the burdensome pressures of rolling your mower inside. Unfortunately Keter’s Elite-Store is brand new to market as I write this article. As soon as I saw it for sale in the UK was perfect timing for me to deliver the review however it’s not yet available in the USA either, it looks like a waiting game until it becomes available worldwide. I only concentrate on the USA and UK market due to time constraints of solely writing this website however I always recommend searching the eBay platform to purchase these products overseas because many sellers offer international free shipping on top of eBay’s highly competitive prices. I currently have eBay links to Keter’s Grande-Store within the prices section that’s a more spacious unit than the Elite but still retains the low-profile design. Hopefully this delivers an alternative solution, I do know a few in America who have opted to purchase from sellers offering international free shipping to the USA from the eBay platform which has worked out fine for them. And the price of £ 200 is reasonable for this space- saver. Hey Mario, thanks for calling in to read about the many benefits Elite-Store provides and your kind words in the way you describe this article. 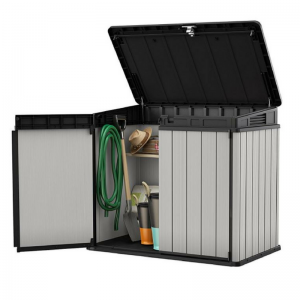 One day – you never know, an outside storage unit may provide the services you require to protectively shield away things like gardening equipment, patio necessities & swimming gear along with the conglomerate of outdoorsy accessories we keep accumulating, from sporty stuff to kids toys. I think the price-mark is pretty fair considering the Duotech make-up that assures rot resistance along with being customise-able meanwhile the fascia does exhibit stylish silvery eye-appeal for the purpose of enhancing the home-yard. There are cheaper facilities in a similar size like Keter’s Store-It-Out Max which comes in at half the price but due to being original, the features and facade panels lack Elite-Store’s robustness and style but that’s purely down to modern ways of innovative manufacturing methods and ever evolving technical advancements. I have two friends who have just moved into a new house in London with their brand new baby, and I’m sure they would benefit from the information you have provided. They will definitely need good storage space and at a low cost. I have forwarded your post onto them. Also, I have recommended that they bookmark your site and revisit for further posts that they would benefit from. Hi Tom, thanks for dropping by to investigate Keter’s Elite-Store. Having enough storage space indoors to accommodate all our outdoor clobber always presents issues for most of us meanwhile they provide beneficial services when moving house. The Elite-Store is pretty basic to assembly, there a quite a few screws but the configuration is straightforward to put together therefore can be constructed & stocked up in minimal time which time-wise is beneficial when moving house. The Duotech material manufacturing the Elite-Store is decay-resistant, impermeable and designed weatherproof to combat depreciation through weather changes therefore protectively shelters your outside gear. Hi Simon, Thank you for the article about the sheds, They sound great and look great. I love the idea that they can be painted so would blend in with the color of the walls of either the house or the outside wall. Hey Jill, thanks for reading about Elite-Store’s characteristics and storage potential. Duotech manufacture exhibits neutral yet elegant lustrous silvery tones that do complement the settings outside a home, whether it’s situated on a balcony, a decked area, patio or poolside meanwhile like you remark, having the potential to paint the store provides the opportunity to create your own artistic statement. I was initially surprised Duotech manufacture adhered to acrylic emulsion. We use this kind of paint for every internal room we decorate nowadays because normal emulsion always left scuff marks after wiping down whereas Acrylic contains a hardener that caters for such services and remains unaffected. So there’s every shade under the rainbow to choose from Jill, plus there’s the choice of finishing style too, from matt to high sheen gloss meanwhile Elite’s beauty relates to when it’s time for a re-paint after the colour fades, there will be no decaying problems to sort before commencing, merely a wipe down and dry. Thanks for sharing this storage. I’ll always find some very interesting products to organize and store things on your site. Hey Jerry, thanks for calling in to explore the highlights of Elite-Store’s make-up and features. The Elite-Store represents a mini shed design that sits unobtrusively in restricted placements, underneath the typical fence height and window ledge meanwhile the lustrous silvery tones blend presentably within patio and urban-balcony surroundings. We review all styles of outdoor storage solutions made with a weather-resistant manufacture, from spacious walk-in storehouses to narrow & slimline varieties, a wide spectrum of shapely deck box designs and horizontal sheds such as this Elite. The beauty about these low-profile units is they are a doddle to assemble, planning laws are exempt whilst their unassuming stature modestly stations without obscuring a garden’s outlook. Most new-build homes are not designed with enough cupboard space to lodge our ever-expanding outdoorsy storage whilst conventional garages are mainly too slim to accommodate most of our gardening tools & equipment along with the car hence our huge interest in constructing outside facilities to protectively shelter meanwhile a rot resistant manufacture escapes upcoming headaches.